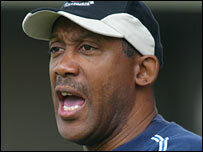 Peterborough United have appointed former Lincoln City boss Keith Alexander as their new manager. Posh director of football Barry Fry also interviewed ex-Torquay boss Leroy Rosenior for the position. Steve Bleasdale had been caretaker boss since Mark Wright was sacked in January but left London Road in April. "If you are not successful you will be looking over your shoulder. But if I didn't think I could handle it, I wouldn't be here," Alexander said. "There is a decent squad here with lots of potential and we will be working hard to get out of this division." Alexander, who played under Fry at Barnet, parted company with the Imps earlier this month after guiding them to the play-offs for the fourth successive season. Fry revealed he wanted the 47-year-old a year ago but was put off by Lincoln's compensation demands. "I've been after Keith for a long time. We've kept in touch, and when I decided to go upstairs the first call I made was to Lincoln. "I was granted permission to speak to him but there was a big compensation clause so it was not possible. But it's been worth the wait. "He is the ideal manager for this football club, he performed miracles at Lincoln, getting them into the play-offs every year on a limited budget and he fits into our youth policy."